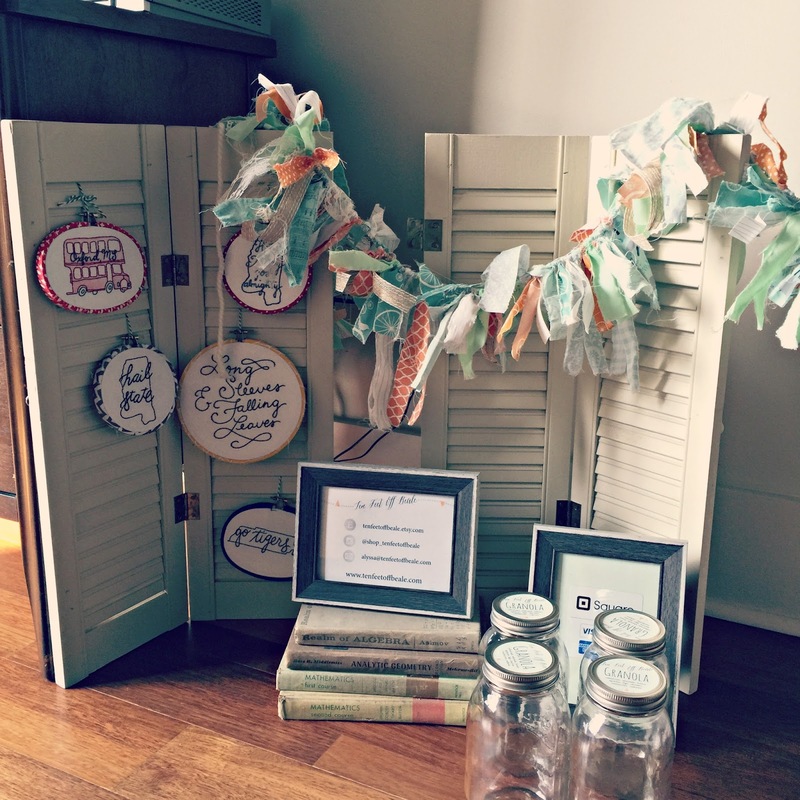 Ten Feet Off Beale: Oxford Maker's Market - This Saturday! Oxford Maker's Market - This Saturday! I have been stitching embroidery hoops like crazy lately because this Saturday, I will be packing up my inventory and heading down to the Oxford Maker's Market in Oxford, Mississippi. This will be the first time Ten Feet Off Beale will have a tent at a market like this!! I'm super excited andddd a little nervous, but I know it will be a great time. I just checked the weather forecast and it is supposed to be an absolutely gorgeous fall day. 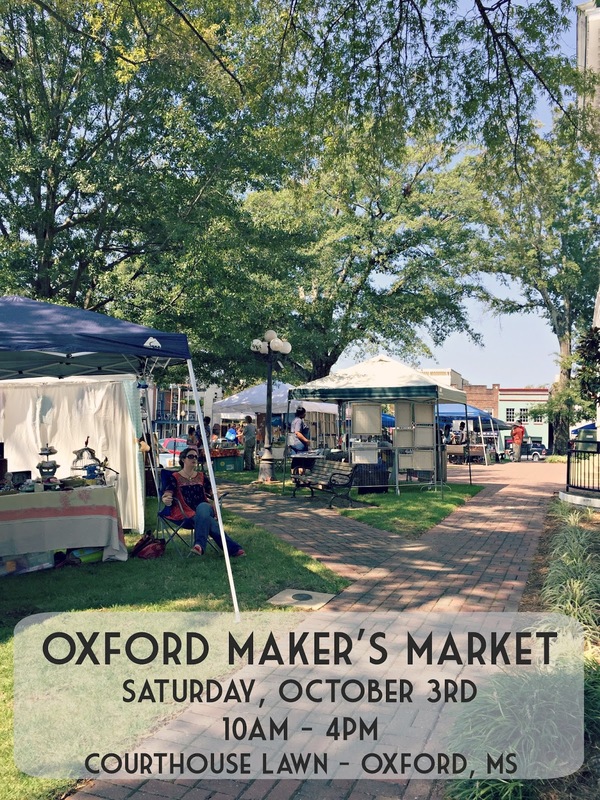 The perfect day to head down to Oxford, Mississippi and mosey around the beautiful town square, at the Oxford Maker's Market, of course! Did I mention there will be live music? Yep. It will definitely be a fun time. So, not only will I be there with my husband (duh) but Midtown Glassworks will also be there! They're really good friends of ours that you might remember being mentioned on this here blog last year. Check out the post I wrote to see a little behind the scenes of the gorgeous glass art they create. Speaking of behind the scenes, here's a little preview of my display! Psssssst I will also have a very special Ten Feet Off Beale prize pack for the first person who finds my tent at the Oxford Maker's Market and mentions that they read this on my blog! So, if you're in Memphis or nearby in Mississippi, I definitely suggest spending your Saturday on the square. Come say hello! Congratulations on your first tent! Enjoy the market and the fall weather! Best of luck on your first tent sale! Love the mason jar lids!!! Good luck! You have great merchandise and I'm sure you'll do awesome! Nothing better than a farmers market! Good luck! Looks like you have made some wonderful things!